"Another Nana disappeared. So the grandson carries a cage. He ever has his cage. And Nana's never coming back. So come into the cage and become Nana's shade…." At first, one might assume she's just some dead lady, possibly a hollowed undead. But, why is she tied to the Mound-Makers covenant? 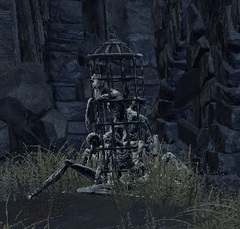 Following Sirris's quest line, after killing Aldrich, a unique Budding Green Blossom will appear in the Shrine Handmaid's shop inventory. The item description has a special notation that reads: "Good-bye, dear Grandmother. I will visit Grandfather, in the Pit of Hollows." The implication is that Sirris left the item with the Shrine Handmaid, her Grandmother, before confronting Holy Knight Hodrick, her Grandfather. So, the Nana that disappeared is the Shrine Handmaid. The covenant altar, in the Pit of Hollows, is where you put "Family" you pile them up and you wont be lonely. When transported to the pit, you are dumped into a burial mound as a surrogate for his missing grandmother, to deal with his grief, or hollowing. I sort of had the same theory about the handmaid being Sirris's grandmother, but there's really not a whole lot of evidence that proves it. Plus, if it was a gift, why would she sell it? The only evidence seems to be in the special Blossom's description. A counter-argument could easily be made because the Handmaid is most likely very very old. So, the term Grandmother could just be one of respect or station in the covenant and not a familial one in this case. I don't understand how Sirris being the Shrine Handmaiden's granddaughter has anything to do with this. 1. The Shrine Handmaiden didn't disappear. She's been sitting around at Firelink Shrine for eons (At the very least since the Untended Graves timeline). 2. Who's the grandson with the cage? You only mentioned a grandmother, granddaughter, and grandfather. "Still closed, still closed…. Mmmmmm…"
I think that if the familial terms are in reference to blood relations, that the grandson could be the hollowed man that carries the cage. I'm not entirely sure that the Untended Graves is in the same timeline though.